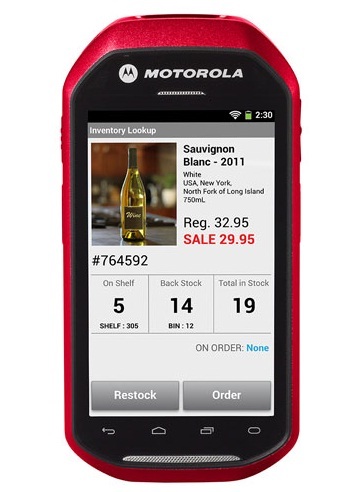 The availability of Android based devices for line of business applications continues as Motorola launch the MC40 for retail enterprise mobility. MC40 joins the Handheld X1 and the Honeywell 70e in what was until recently a category that the major enterprise mobility manufacturers had always populated with .NET product. Options include a Magnetic Stripe Reader and an interesting assortment of charging accessories and cradles. It is also available in various groovy colours ! Check out the MC40 Specification Sheet for complete details. It is likely that this category of product will start to be seen a lot more in enterprise mobility projects outside the retail as major projects are already asking for Android based rugged handhelds. Users will easily adopt this form factor as it has become so familiar in the consumer area. The MC40 comes with a relatively high list price but do not expect huge discounts unless you have a huge order to place. Product Longevity – likely to be a lot longer in production than consumer brands which helps make sense of managing the life cycle of a large deployment. Built for High Frequency use – the enterprise mobility manufacturers know a thing or two about building rugged products that will see many bumps drops and scrapes. Break Fix and Total Cost of Ownership – Having a rugged handheld in the field is in part based on the premise that in the event of a fault the facility exists to repair it rather than send it for scrap. Manufacturers like Motorola have a lot of their business invested in repair services so expect this to be a big TCO value added dimension for the MC40. Accessories – I know boring! but having docking cradles spare battery chargers etc can really make all the difference to the usability of any mobile computer. Like the X1 and the 70e the MC40 could be susceptible to theft so best to revise employee procedures and load up with MDM software. Bring Your Own Device – The MC40 will make an attractive 3 Year BYOD bundle when combined with finance, support airtime and a process specific app. MobileWorxs can help you navigate your way through the device selection process and help you deliver an enterprise mobility project that adds value to your business.